I had the best, the best macaroni and cheese last month in Seattle, so I’ve since been inspired to create my own (healthified) version of this ultimate comfort food. Made with butter, flour, heavy cream, and tons of white pasta, a traditional mac and cheese was definitely not going to work for a healthy recipe site. So I made my own ‘Tuscan”-style mac and cheese. It’s really cheesy and addictingly delicious, it has some bacon too, and it’s one of my new favorites. …kale, cannellini beans, and whole wheat pasta. And here’s the place in Seattle that’s the inspiration behind it all. This is Beecher’s Handmade Cheese, and I adored this place. I see looking at this photo that this employee was none too pleased to be in my snapshot. But I wanted a photo of the artisan cheeses that are handmade on-site. 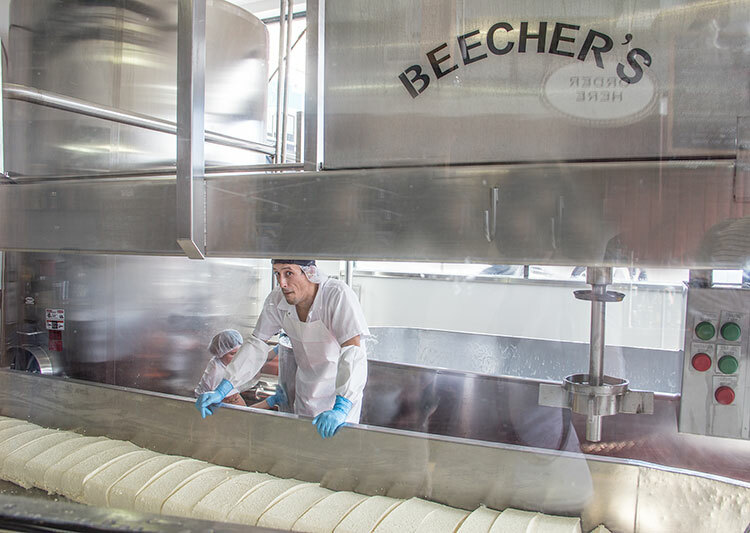 There’s floor-to-ceiling glass so everyone can see the process of creating the cheeses, and they have an adjoining shop where you can buy these cheeses, along with their signature dishes, like their macaroni and cheese. 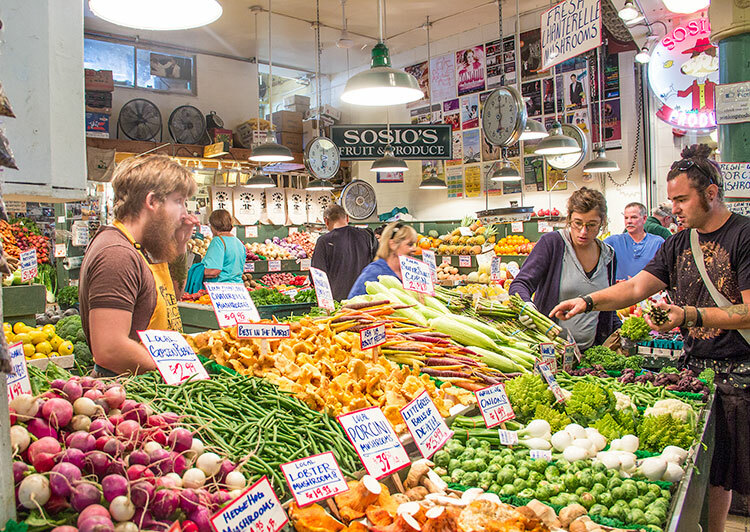 Beecher’s is located at the Pike Place Market in Seattle. 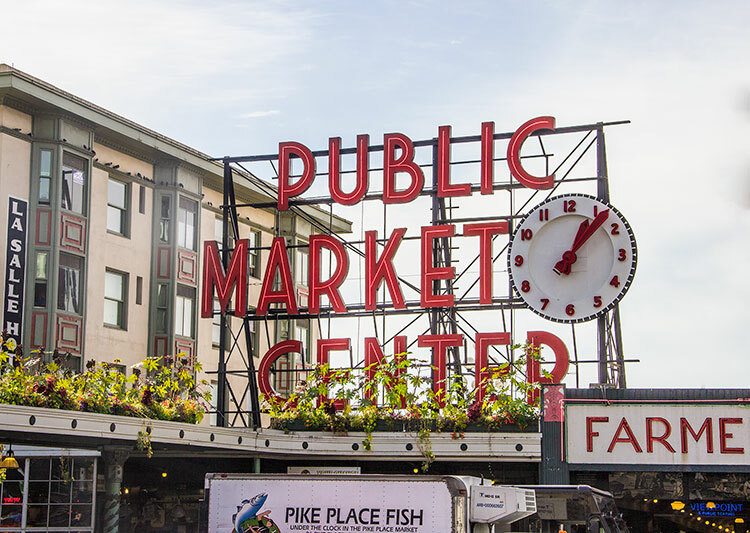 Most have heard of it because of the Pike Place Fish Market, where employees are seen throwing fresh fish over the counters. 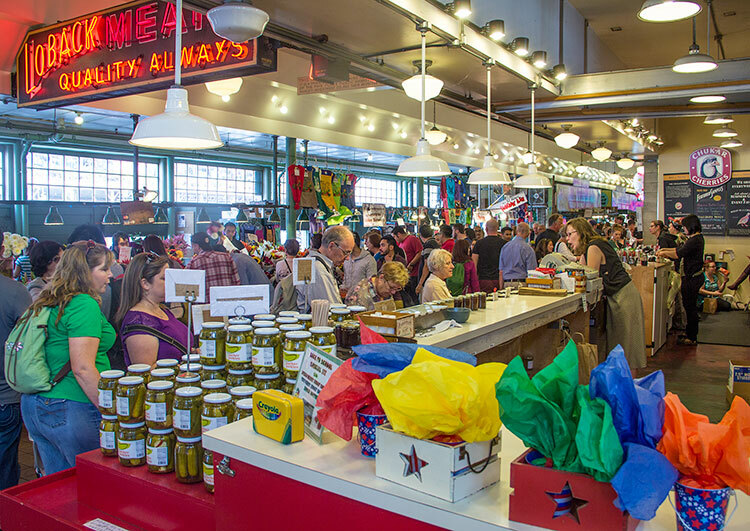 But the market has so much more than local, fresh fish — it spans several blocks, with a huge variety of artisan foods, chocolates, pastries, locally grown produce, and tons of local crafts and art displays too. The place is packed with tourists and locals alike. Here are all the ingredients you’ll need for the Tuscan mac and cheese. 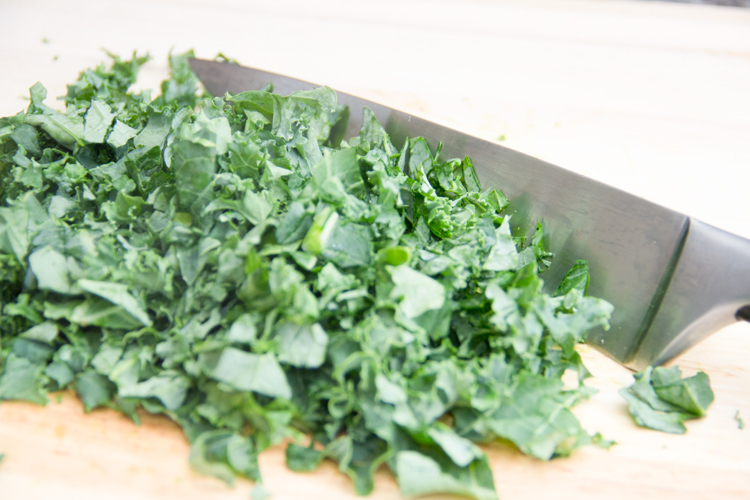 First, grab a few handfuls of fresh kale and run your knife through the pile in every direction, chopping it into bite-sized pieces. 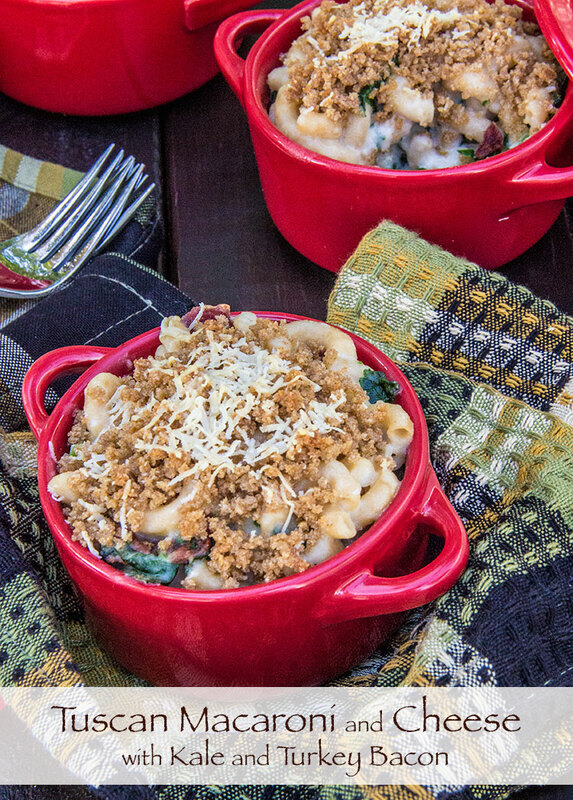 Cutting the kale into finely chopped little bits is the key to making this veggie blend right into the mac and cheese, to the point you hardly notice it’s there. That kale also transforms this mac and cheese into a highly nutritious dish, packed with Vitamin A (to protect against cancer), Vitamin C (to strengthen the immune system), and Vitamin A (for healthy vision), fiber (to help detox the body), iron, and calcium. 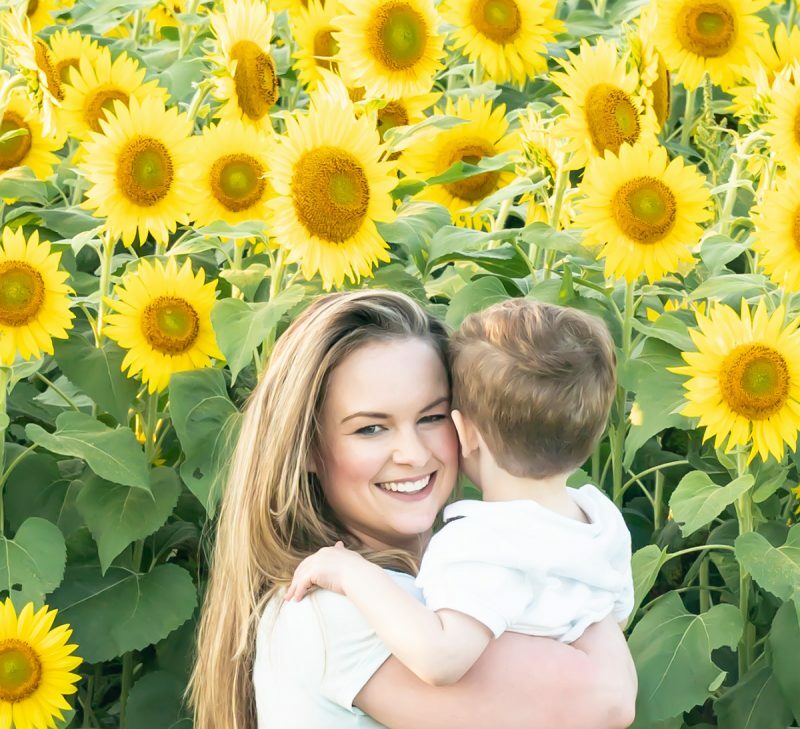 The list is endless for this healthy green! 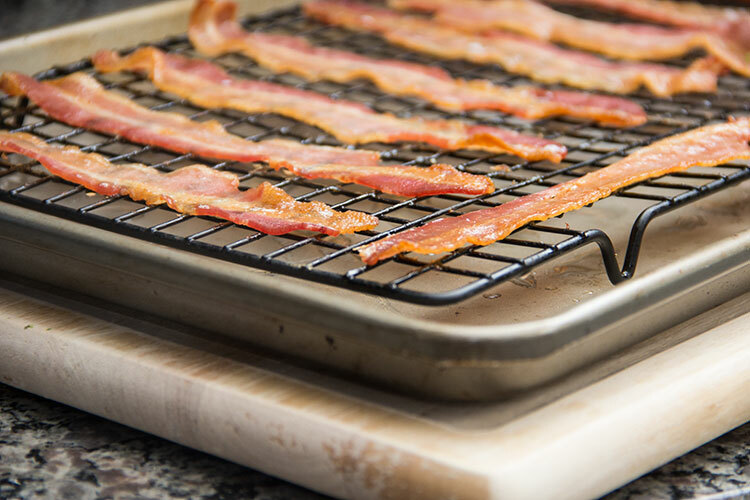 Next, crisp up some bacon by heating it in the microwave or the oven. Then crumble it into small bits. I used turkey bacon for the first time in this recipe and, true, a strip of turkey bacon does not taste quite like the regular kind. However, it works in this recipe because the bacon is crumbled into bits and mixed in with the mac and cheese. So it just adds a hint of crispy, salty, tastiness that really perfectly complements the cheesy macaroni. I use three cheeses in this dish for lots of flavor: extra sharp white cheddar, Asiago, and a good quality Parmesan (Parmigiano-Reggiano). When the prep work is done, preheat the oven to 350 degrees F.
Next, boil a large pot of water. Salt the water and add some whole wheat elbow macaroni. Cook until it’s almost al dente, about 6-7 minutes, and drain. The macaroni will continue to cook a bit more when you put it in the oven at the end. Meanwhile, heat a bit of olive oil in a small sauté pan over medium heat. Add the chopped kale, season with a pinch of salt and pepper, and cook until the kale is softened. Then pour the kale into a large casserole dish. Next, heat up some low-fat milk in a saucepan over medium-low heat. When the milk just begins to simmer, but before it boils, turn off the heat. 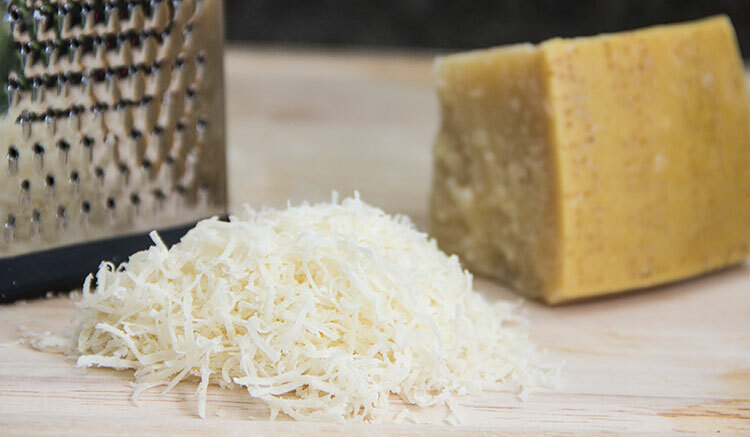 Immediately stir in the Asiago, Parmesan, and cheddar cheeses. The milk will be hot enough to instantly melt the cheese as you continue to stir. Next I add some Cannellini white beans to thicken the sauce. 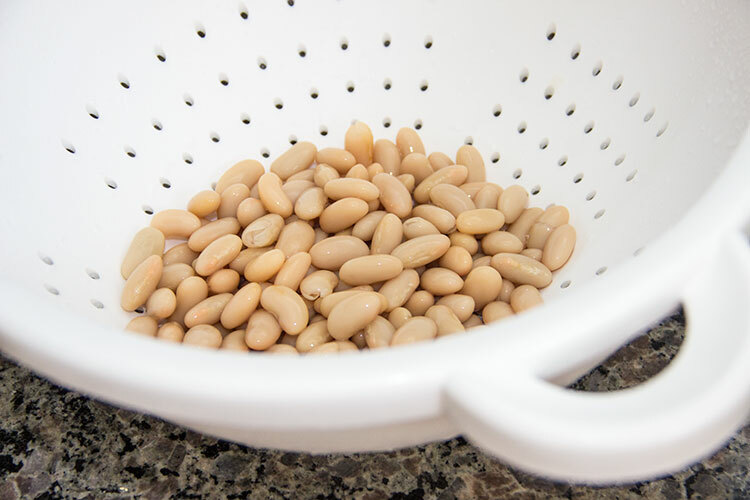 I love substituting Cannellini beans as a thickener (instead of using the classic carb- and fat-filled white flour and butter) because they’re healthy: very low in fat and high in fiber and antioxidants. Just drain and thoroughly rinse the beans. Then stir the beans into the sauce and purée the mixture using an immersion hand blender (or transfer the mixture to a blender or food processor to purée). 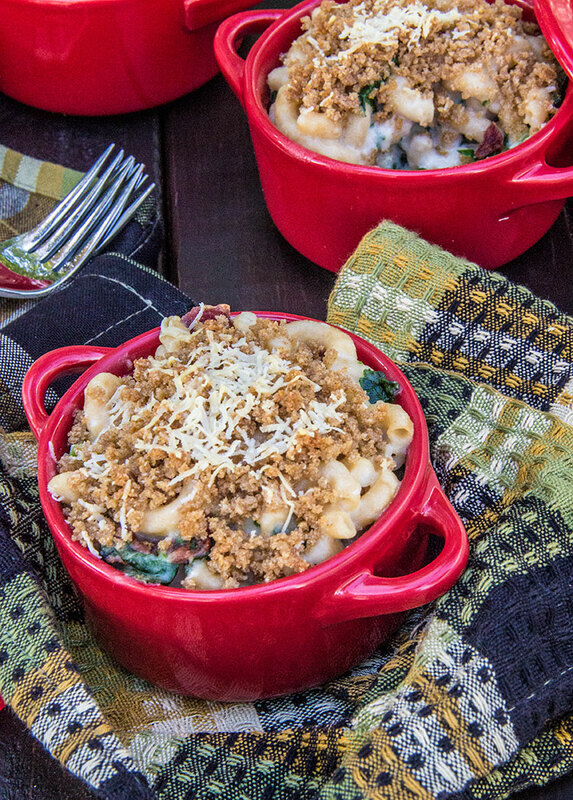 Along with the kale, add the cooked macaroni, crumbled bacon, and the cheese mixture to the casserole dish. Gently stir until all the ingredients are well coated with cheese sauce. In a small bowl, combine a bit of Parmesan, the bread crumbs, and a few drops of olive oil. Stir until the bread crumbs are well coated in oil. Sprinkle the bread crumb mixture over the top of the macaroni and cheese. Then toss the macaroni and cheese into the oven and bake until the bread crumbs are crisp and golden. This one is a favorite of both Meat-and-Potatoes-Guy and I. And how could it not be. 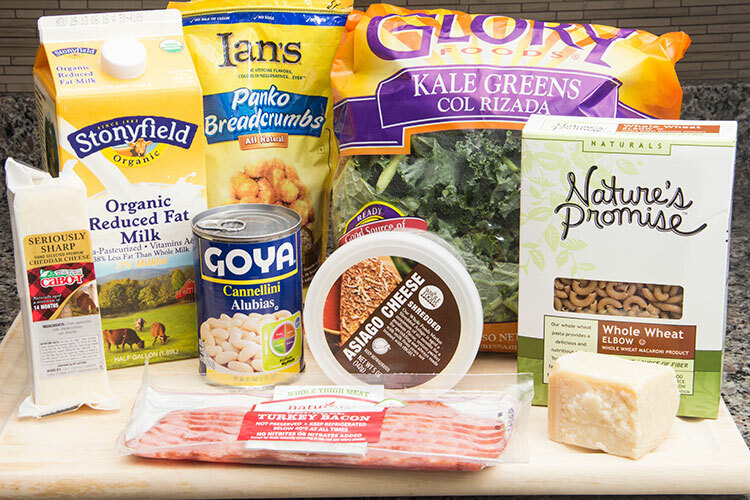 With all the richly flavored cheeses and crispy bits of bacon, it’s comfort food at its best. What you probably won’t notice at all: the white beans and kale, which help make this dish highly nutritious too! Boil a large pot of water. Salt the water and add the macaroni. Cook until almost al dente, about 6-7 minutes. Meanwhile, heat 2 teaspoons olive oil in a small sauté pan over medium heat. 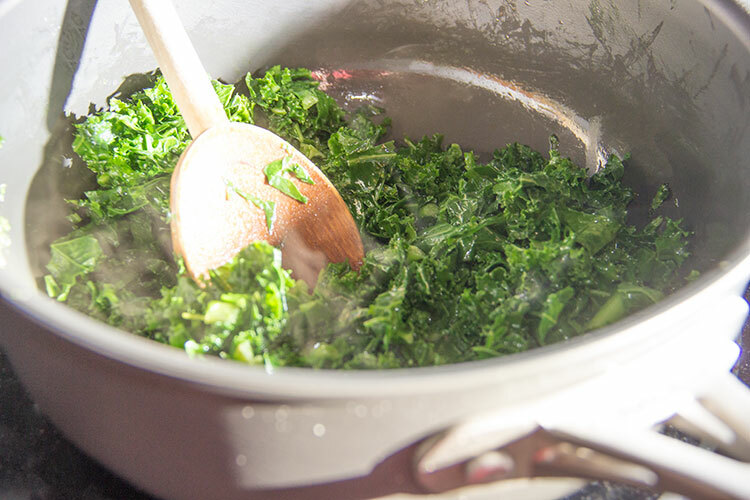 Add the kale, season with a pinch of salt and pepper, and cook until kale is softened, about 4-6 minutes. Transfer the kale to a large casserole dish. 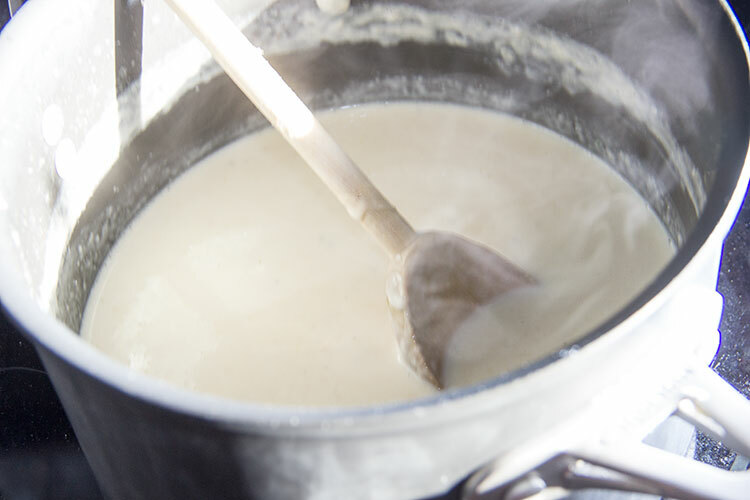 Heat the milk in a saucepan over medium-low heat. When the milk begins to simmer, but before it boils, turn off the heat. Immediately stir in all of the Asiago, ⅔ cup of the Parmesan, and all of the cheddar. Also stir in the beans and season to taste with salt and pepper. Purée the cheese mixture using an immersion hand blender (or transfer mixture to a blender or food processor to purée). 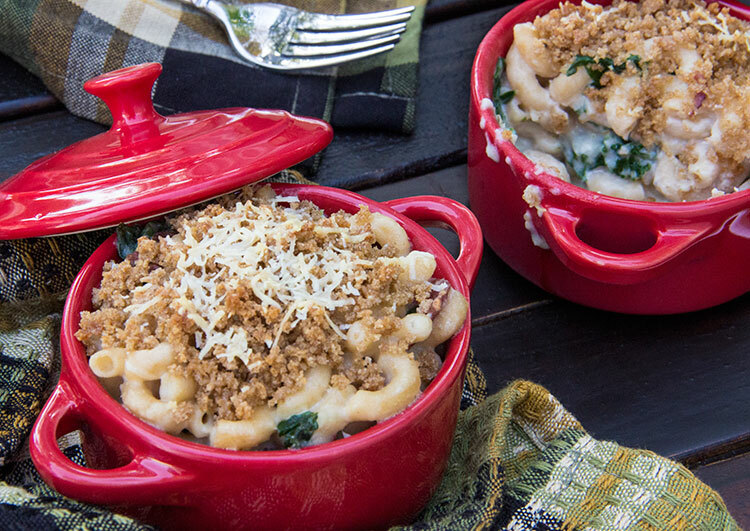 Along with the kale, add the cooked macaroni, crumbled bacon, and the cheese mixture to the casserole dish. Gently stir until all ingredients are well combined. 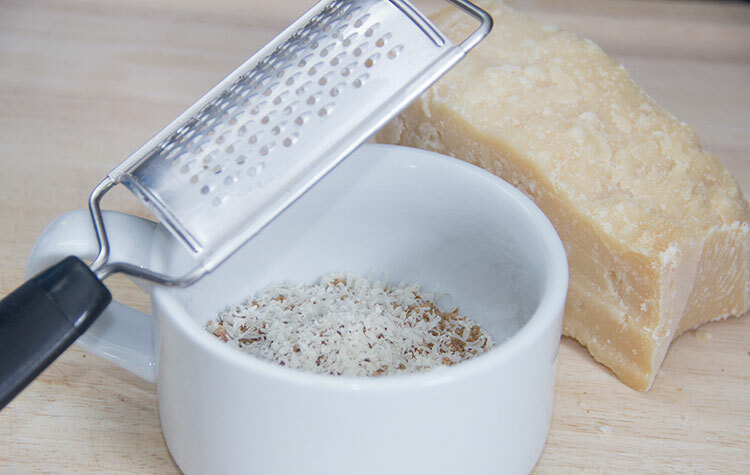 In a small bowl, combine 2 tablespoons Parmesan, the bread crumbs, and ½ teaspoon olive oil. Stir until bread crumbs are well coated in oil. Sprinkle the bread crumb mixture over the top of the macaroni and cheese. Bake the macaroni and cheese until bread crumbs are crisp and golden, about 15 minutes. Serve. I love that you use cannellini beans to thicken the sauce – such a smart move! I’ve used them to thicken soups but never a sauce. I’ll have to try that! 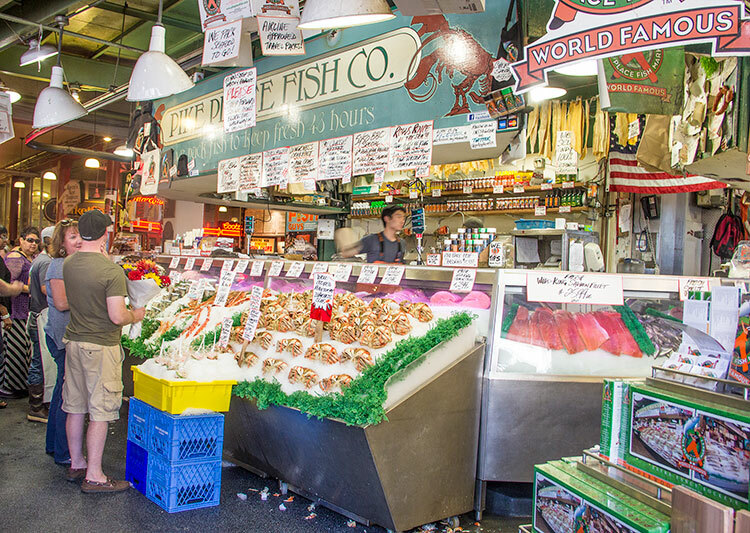 Seattle Pike Market … what a place, heaven for foodies and specially the Pike Fish .. they truly put on a stunning show. Seattle does good mac n’cheese. 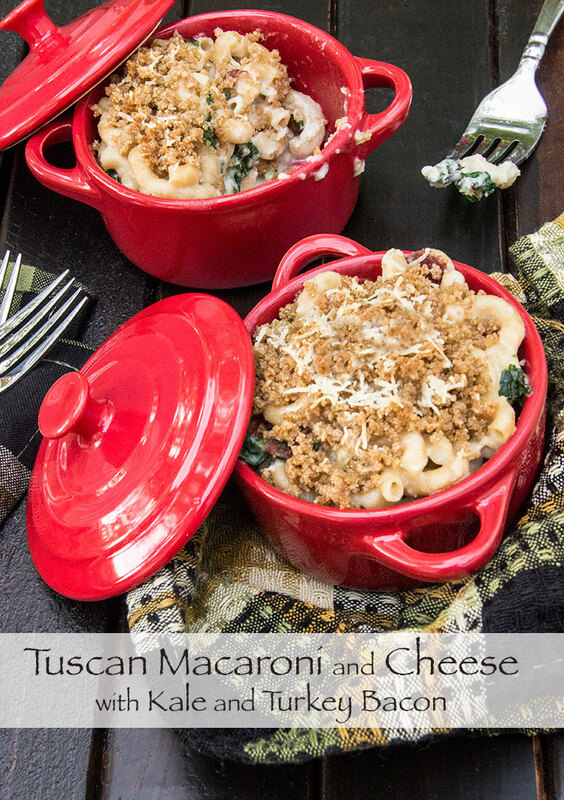 Lovely dish again and I love your red pots and your mac n’cheese looks so moist and … great job, not easy to make a great mac n’cheese. What I don’t understand is all this products that is made out of turkey those days … bacon ???!!! For me is there only one bacon, but it’s popular over here too – I don’t like turkey in any form and shape .. and scared to death of them when they are alive *smile … some evil streaks in them, I promise you. Just a wonderful post again, even if there is both kale and turkey bacon in the dish. I’m sure I would love it somebody didn’t tell me what was in it .. before I start eating. I wish you and the men in your life a fantastic weekend, Jen. My husband made this last night and OMG, it was delicious! 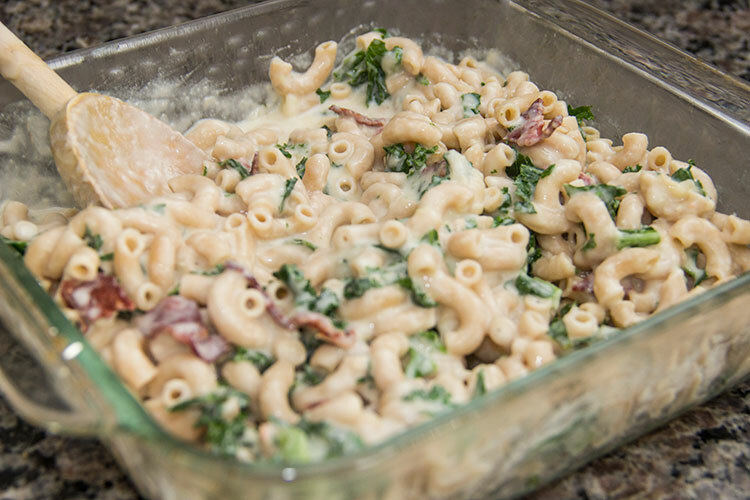 A full meal too, unlike traditional mac n cheese that you feel guilty eating, this recipe snuck in some delicious and nutritious ingredients. My guilt level registered…ZERO! I must say I’ve made a few of your other recipes and they have all been delicious. Love the pictures, it’s really helpful. Keep doing what you’re doing Jen!! I’ve made this several times now and it’s now a favorite recipe of mine. I use real bacon and sometimes throw in chunks of lean meat such as ham or chicken breast to make it into a more hearty meal. I have to stop myself from eating all casserole before putting it in the oven. Excellent recipe! Thanks for posting!